The car could claim to be part "ERA", part "BRM" and part "Raymond Mays". In the immediate pre WW2 period Mays parted company with the ERA works team, the war years were restricted to planning things for better times and after the war he was the main force behind the "All British" GP project that became BRM. Before and after the war he was still active and successful in competition and at the end of the 1940s was to produce a personal project to keep his hillclimb and sprint activities competitive. "It is in the transmission that the greatest interest in the new car lies. From the rear of the engine, a short, universally-jointed shaft transmits the drive to the input shaft of the Borg and Beck clutch, which is located beneath the drivers knees; thence a further short shaft leads to the Wilson-type four-speed epicyelic gearbox, which is bolted direct to the casing of the underslung worm final drive. 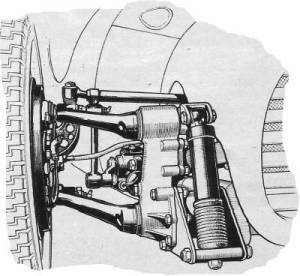 This assembly is bolted rigidly to the chassis and, from it, short tubular axle casings (located by U-bolts) extend on either side and serve the double purpose of housing the fully - floating live half shafts and acting as mountings for a pair of cast assemblies which form a unique feature of the whole design. Each of these assemblies extends forwards to serve the dual role of chain case and radius arm, and rearwards to form the moveable abutment of the Lockheed air struts, a pair of which provides the rear suspension. They are carried on needle-roller bearings on widely-spaced centres for rigidity. As will have been gathered, the final drive is by chains (of the triplex roller type) and the driving sprockets are mounted on ball bearings, whilst the driven sprockets are splined to short shafts which run in taperroller bearings and extend through the casings to flanged ends which carry the rear bolt-on wheels. Thus the rear suspension is independent, with a vertical wheel movement giving constant track and camber. The fixed abutments of the Lockheed struts take the form of brackets welded to the side members and an anti-roll bar is incorporated in the design." From the Motor of 24 May 1950. The car had a 33 front / 67 rear weight distribution due to the radiator and engine being set well back and a great deal of the transmission placed behind the rear wheel centre line. The engine was a 2-litre Zoller supercharged ERA 6 cylinder. The car employed a four pedal layout. Brake and accelerator for the right foot. The left foot controlled the usual pedal for a pre-selector gearbox (for "automatic" clutch/gearchange). The extra pedal is a "launch control" via a normal plate clutch. Use of this extra pedal was to give maximum acceleration from a standing start without excessive slip from either the wheels or the internal bands of the pre-selector gearbox. 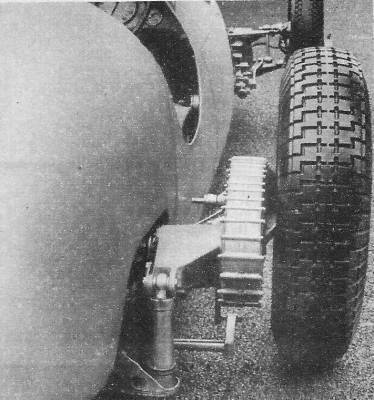 The car did not use rear wheel brakes - a single brake acted directly on the transmission (a method later used by BRM). The car was never raced. This may be due to rear end instability due to quirks of the unusual transmission/suspension. It could also be due to the BRM parts and labour used for the personal project of Mays. 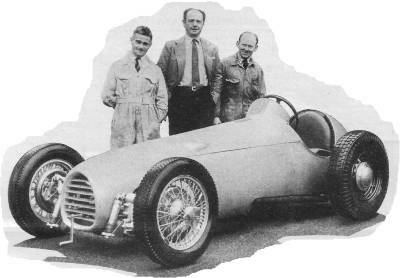 It is said the BRM Trust insisted that the project was stopped and the front suspension should be removed for use on the BRM V16 car. The car may have been broken up or the chassis (less front and rear ends) may have been used to form the ERA Special of Jim Berry.